When you bite into corn-on-the-cob or a burger you probably aren’t thinking about what tiny compounds are entering your body or about how they can be improved. Those tiny compounds are amino acids and serve as the building blocks of protein. They also play a major role in a recent interdisciplinary research project at the Bond Life Science Center. Look no further than crops like corn and soybeans. While widely eaten by both livestock and people worldwide, these plants are deficient in several essential amino acids and it takes a lot for the consumer to be satisfied. Amino acids make up a large portion of human’s cells, muscles, and tissues. They are also an important part of nutrition. Angelovici said the solution lies in learning to manipulate amino acids to improve the quality of the seed. Previous experiments to improve a crop’s level of amino acid have not had much success, so Angelovici decided it was time to try something different. She decided ask if different appearances across plants, like the size of leaves or color, have any connection based on the seed it grew from. Past research suggested that the same genes may control both seed nutrition and aspects like structure, but Angelovici’s research is unique in its combination of research on plant structural characteristics, DNA polymorphism and metabolism. A competitive seed grant of $99,690 from Bond LSC helped get this work off the ground. She decided a few new tools and people were needed to explore this. That’s where Heather Hunt from the College of Engineering and Scott Givan in the MU Informatics Research Core Facility come in. While Hunt has a background in bioengineering, for years she has teamed up on projects in the Plant Sciences department. “There’s a lot of things we do as engineers that can be very useful particularly to people in plant science, particularly in terms of equipment and instrumentation, helping them develop faster methods to do things,” Hunt said. High throughput phenotyping is one of those things. This catalogues a large number of physical features from a study group. The team determined the research required the rapid collecting of this characteristic data from a large number of plants and multiple levels of analysis. To achieve this, the team envisioned the construction of a physical cart along with the development of hardware and software. Hunt explained, in the past, students from a bioengineering capstone class would work on a project like this, but the teams kept running into the same problem. “They were all talented and dedicated and hardworking but there were just things they didn’t know because they weren’t a computer engineer or a computer scientist, so they knew how to code but they didn’t necessarily have the breadth of skills someone in that area would,” Hunt explained of her past project experience. 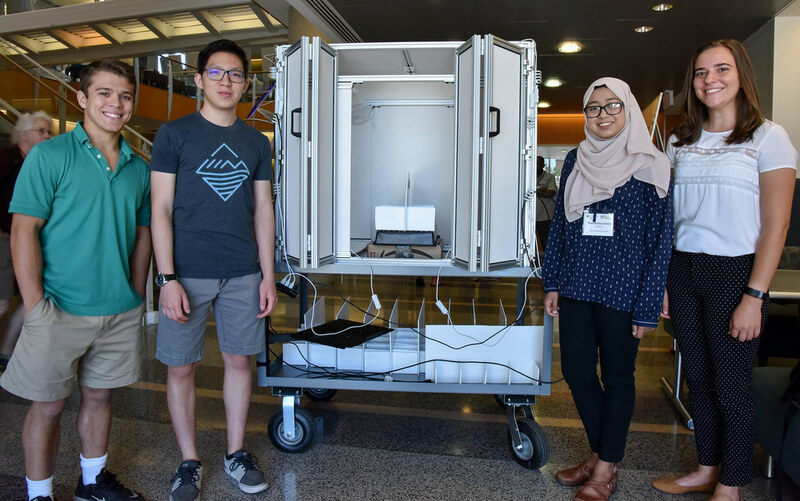 MU engineering undergraduates, Jacob Gajewski, Yen On Chan, Nurhidayatun Anuar, and Chloe Rees, stand besides a mobile phenotyping station they designed and built. | Photo by Samantha Kummerer, Bond LSC. This time an interdisciplinary team made up of undergraduates in mechanical, biological and computer engineering combined to figure out if a plant’s physical characteristics hint at the content of its seeds. The team spent the last semester building a high throughput phenotyping station costing more than $10,000 from scratch. The station is on wheels can easily be moved between growth chambers. Equipped with cameras, the device photographs eight plants at once. The images capture the plant color, leaf size, and shape along with other characteristics in seconds. But the road to this final product came with some communication challenges caused by the multiple educational backgrounds of each team member. “Sometimes we’d have conversations where we’re talking about one thing and we’re trying to all find the phrasing that makes sense to us and we kind of just go around in a circle and then we eventually figure it out, but we get there in the end,” Hunt explained. Both Angelovici and Hunt said when working in an interdisciplinary team, it is very similar to having to learn a new language. “As a biologist, I think it’s very interesting to look at how engineers are thinking on things, so working with Heather, for me, was illuminating. We work very differently, we have different languages of how we think about an experiment,” Angelovici said. Despite minor communication barriers, Hunt said the project has gone unusually smooth for her and credits the interdisciplinary team and the in-depth planning. “All this interdisciplinary work will be our future in biology, so I think this is a great start for them and for us,” Angelovici agreed. Now that the station is built, the team is taking the summer to work out kinks and begin initial data collection. While they hope to one day evaluate crops, the current work is with multiple the model plant, Arabidopsis thaliana. A look inside the mobile cart the team of engineering students designed and built. 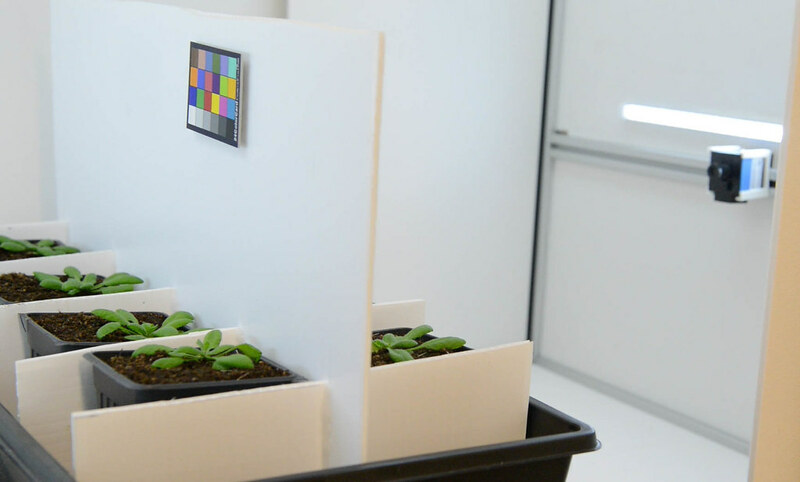 The machine photographs eight plants at once using four different cameras. | Photo by Samantha Kummerer. Bond LSC. Data collection for the mock experiment is expected to start late summer. When it does, the team will take photos of many, many plants throughout their four-week life span. The images will then be analyzed for things like the shape of the leaf, the area of the rosette, color, and plant size. By December, Angelovici hopes to determine if there is a connection between what the plants look like and the quality of the seeds. If that connection is established, the next step is to figure out how the two are correlated and if the research and hypothesis are translatable to crops. Heather Hunt is an assistant professor in the bioengineering Department at the University of Missouri. She earned her B.S. from Iowa State University and M.S. along with her Ph. D from the California Institute of Technology. She was awarded the 2010-2011 WiSE Merit Award for Excellence in Postdoctoral Research and the 2015 3M Non-tenured Faculty Award for her current biosensors research at Mizzou. Scott Givan is the associate director of MU’s Informatics Research Core Facility. He earned his B.S. in biochemistry from Purdue University and his Ph. D in biology from the University of Oregon.